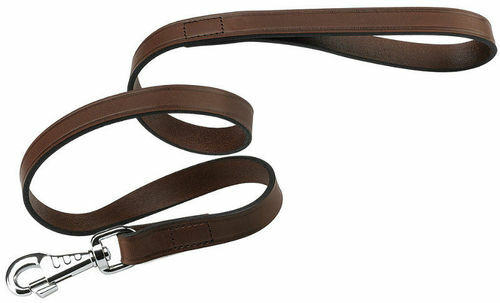 Made from bull leather, Vip G is a very sturdy dog lead. Thanks to its comfortable handle, it ensures a safe grip during everyday walks with your faithful friend. You could find Vip in four different sizes of length from 100 to 150 cm and different tape width from 12 to 20 mm. For a total look of your dog, we would like to remind that inside the range of Vip dog leads and collars, you could also choose the short model Vip GM or the classic leather collar Vip in a dark brown colour.